Urban development pressure through high-rise building project impacting on the visual integrity of the Cathedral as a landmark. ICOMOS-UNESCO mission 22 November 2003, UNESCO site visit on 18 August 2004. The State Party submitted to the World Heritage Centre in January 2005 an update report on the state of conservation of the property as requested by the Committee at its 28th session (Suzhou, 2004). 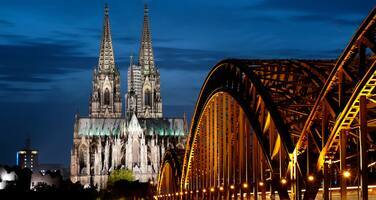 By letter of 30 March 2005, the World Heritage Centre was informed that the City of Cologne has requested a mission to the property before the Committee session. Referring to the Committee’s discussions at its 28th session (Suzhou, 2004), the World Heritage Centre pointed out that the recommendations by the joint UNESCO-ICOMOS mission in November 2003 continue to be valid, and would now have to be implemented by the concerned authorities. Furthermore, it had to be expected that the authorities had presented all relevant aspects of their implementation and planning strategy in the update report. Furthermore, the City of Cologne presented its case, including in-depth discussions with all parties involved, at the Conference in Vienna on “World Heritage and Contemporary Architecture”, which took place from 12 to 14 May 2005. The results of this conference will be presented at the 29th session of the Committee in 2005. ICOMOS stated that the updated report of January 2005 by the State Party does not show new facts, considering that the City of Cologne has not fulfilled any of the recommendations formulated by the joint UNESCO/ICOMOS mission of 22 November 2003, but rather continues the original high rise building concept. ICOMOS considers that the situation has deteriorated, given that the construction of the first high-rise building (RZVK building), which led to the inscription of Cologne Cathedral in the List of World Heritage in Danger, has now been completed and a cluster of four more high-rise buildings is planned to be added. Consequently, the serious concerns stressed in the mission report and the statement of ICOMOS International of 10 May 2004 (Statement of ICOMOS on the "Report to the UNESCO World Heritage Centre on the Cologne Cathedral Heritage Site", City of Cologne 2003/2004) remain valid. ICOMOS further notes that the State Party’s report rightly points out the outstanding role of the Cathedral, of which the repair and maintenance by the Cathedral Workshop can be considered exemplary. There are also the commendable efforts to improve the area around the Cathedral, especially the "Domplatte" with the underground parking lot, presently improved by work on the northern stairways. a) Buffer zone: The State Party’s report indicates "to provide details as to the establishment of a buffer zone" (p. 3). However, mention of "varying height limits" in the past decades and the statement that a "planned buffer zone will cover the panoramic view over a length of 4000 metres" while no revised version of a buffer zone has been provided officially yet, which would have to make reference to the historic centre on the left bank as well as to the bridge and the right bank. Through press releases, it is known that work on a buffer-zone is under discussion. b) Height planning scheme for the left-bank City Centre: The new height planning scheme was presented to the public shortly after the visit of the Mayor of Cologne to UNESCO Headquarters in Paris, on 8 December 2004. The height development in the old part of the city will be raised from 20 to 22,5 metres; furthermore, in certain streets buildings of up to 40 metres are meant to be erected, and in certain ring roads buildings of 60 metres will be added. ICOMOS notes that, under these circumstances not only additional impairment of the visual integrity of the Cathedral but also of Cologne's famous Romanesque churches is of concern. Experts to whom the new height planning scheme was presented on 14 December 2004 gave a critical evaluation of the height development in the old town and demanded “to assess the potential impact of tall buildings on the Romanesque churches and other significant architectural sites in the vicinity". c) State of planning on the right bank: Disregarding the continuing threat to the visual integrity of the World Heritage property, reference is made to the "slim tower on the site of the LVR Community" (RZVK-Hochhaus), due for completion in September 2005, and also to the progress of plans for four additional towers: a building license for the tower to the east of the railway station "will be submitted in the summer of 2005". However, it has to be noted that for two towers there is no investor yet. The report offers options with "alterations to the ground-plan" and a "height review" and invites the World Heritage Committee "to take part in the process". ICOMOS is particularly concerned about the fact that the City continues its plans for a cluster of high-rises as a counterpart to Cologne Cathedral, participation in plans which, if at all, have only been slightly corrected, seems problematic from ICOMOS' point of view. d) Visual impact study: A university professor of the RWTH Aachen has been requested to evaluate the visual impact study (made August 2003), a study which to ICOMOS is highly doubtful. The result of this evaluation will be presented at the Conference on “World Heritage and Contemporary Architecture” in Vienna, Austria (12-14 May 2005). 11. Decides to retain the Cologne Cathedral (Germany) on the List of World Heritage in Danger and to examine the situation at its 30th session (Vilnius, 2006).